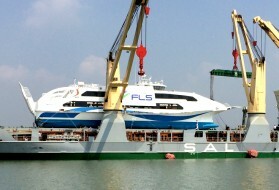 In 2012 FLS was assigned to organize the complete logistics to ship two units of HRSGs for the Chana Combined Cycle Power Plant in the Deep South of Thailand. The project posed various logistical challenges. The site was not accessible by road for all heavy lifts which consisted of 30 boiler modules and two HP drums of up to 200 metric tons each. FLS had to work out a detailed logistical concept that involved the construction of a purpose built jetty close to site as well as the rehabilitation of one kilometer of road from the jetty to public roads. FLS worked closely with all stake holders involved including the local communities to come to a positive outcome. Special consideration was given to effect the lives of local communities as little as possible by carefully planning the construction phase as well as the actual transportation. 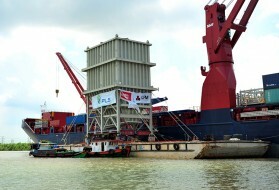 All heavy lifts were shipped by two charter vessels from Korea to the port of Songklha in the South of Thailand. There a direct transfer from ocean vessel to sea going barges took place. The barges then navigated 25km on the open sea to the jetty which was built in the mouth of a river close to the ocean. 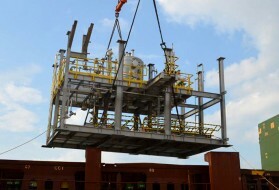 After rolling the heavy lifts off the barges by ramp using self-propelled modular transporter (SPMT) at the jetty they were stored on temporary jack stands and then delivered to site in the required sequence. At site the erection contractor lifted the HRSG-boiler modules directly from the hydraulic multi axle trailers by crawler crane into the boiler house of the power plant. Watch the video below to see how FLS managed this project. 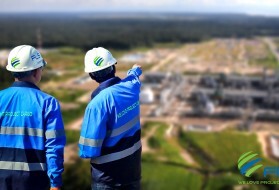 FLS Projects – CHANA POWER PLANT from FLS Projects on Vimeo. 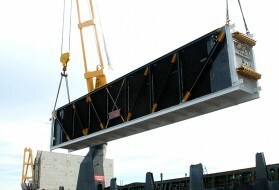 FLS Projects – We love project cargo!